The banana variety Yangambi km5 produces toxic substances that kill the nematode Radopholus similis, a roundworm that infects the root tissue of banana plants – to the frustration of farmers worldwide. The finding bodes well for the Grande Naine, the export banana par excellence, which is very susceptible to the roundworms. The parasitic nematode Radopholus similis is the invisible nemesis of the banana plant, says Professor Dirk De Waele (Laboratory for Tropical Crop Improvement, KU Leuven), a co-author of the study: "This roundworm infects banana crops worldwide. The nematodes are invisible to the naked eye, but they can penetrate the roots of banana plants by the thousands. Once infected, these plants absorb less water and nutrients, resulting in yield losses of up to 75 percent. 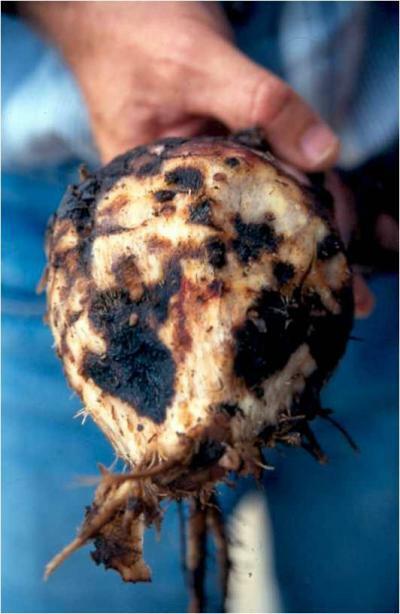 Lesions in the roots also make the plant more susceptible to other diseases. Eventually, the roots begin to rot. In the final stage of the disease, the plant topples over, its fruit bunch inexorably lost." Combating nematodes isn't easy, adds Professor Rony Swennen (Laboratory for Tropical Crop Improvement, KU Leuven), another co-author: "Synthetic pesticides are toxic and expensive. Moreover, pesticides usually do not actually kill the nematodes, they just temporarily paralyze them. Nematodes can also build up resistance to pesticides." This is a root of a banana plant infected by the nematode Radopholus similis. The roundworms infect the roots and kill root tissue. While the Grande Naine is very susceptible to nematodes, other varieties are known to be resistant to them. Enter the Yangambi km5, a variety first grown in the 1950's at a Belgian research station in Yangambi, DR Congo. The researchers compared the two banana varieties and studied their defense responses to Radopholus similis. "Researchers have always wondered how the Yangambi km5 manages to fight off roundworms," says De Waele. "This study goes a long way in answering that." With colleagues at the Max Planck Institute for Chemical Ecology (Germany), the KU Leuven researchers identified which metabolites are responsible for fighting off the nematodes. "We found nine different nematode-killing metabolites in Yangambi km5. These metabolites are also produced in the Grande Naine, but much more slowly and in lesser quantities. In that banana variety, the nematodes win the fight." The new knowledge of metabolites will be helpful in developing edible and pest-resistant banana varieties, says Swennen. "The next step is to screen other banana varieties for metabolites. This method could also be applied to other crops and other species of nematode. Nematodes pose a growing threat to rice production in Asia, for example. Our findings also provide the industry with perspectives to develop a generation of new pesticides against nematodes." 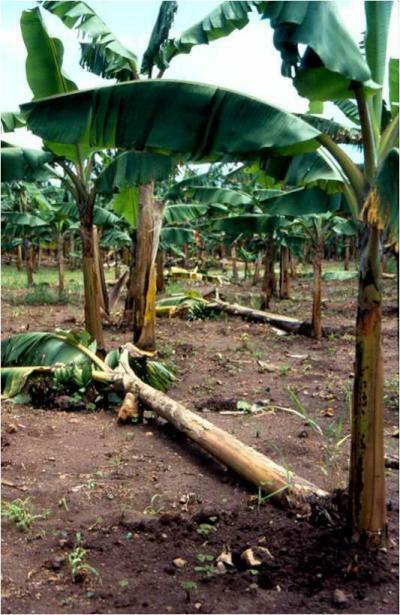 This is a banana field in Uganda planted with Grande Naine, a banana variety commonly sold in the supermarket. The nematode Radopholus similis infects the roots of banana plants. In the final stage of disease, the plant topples over and its fruit bunch is lost.